KATHMANDU, Dec 27: Service seekers in Nepal are compelled to pay the maximum amout of bribes at the land revenue offices to settle land-related matters, according to a recent study. Other offices where people have to bribe officials to get their work done in time and avoid the involvement of middlemen .are the offices related to transportation and health services and local bodies such as village development committees, municipalities, district development committees (DDCs) and the land survey offices. 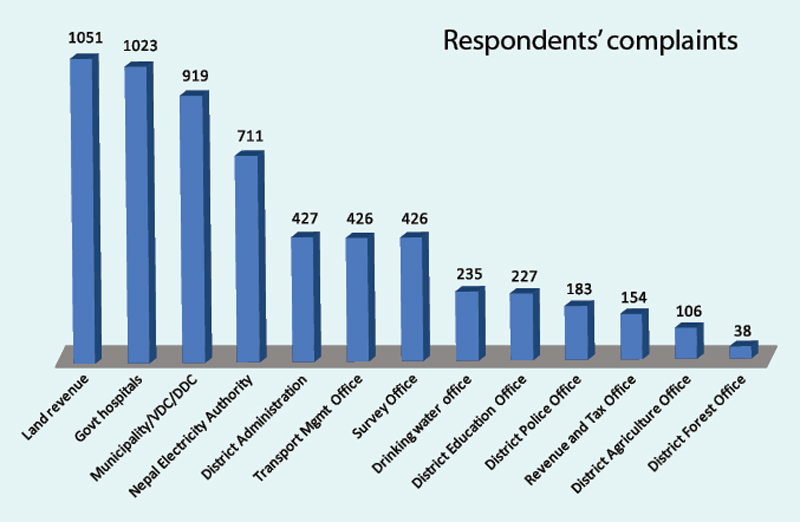 The study conducted by Transparency International Nepal (TI-Nepal) showed that the Land Revenue Office, the Transport Management Office, local bodies and the survey offices are the most corruption-prone. The study (focused on education and local development) is titled ‘Public Service Delivery Survey-2016’. The report released on Monday states that service seekers have to spend additional money as kickbacks for the government officials to get their work fast-tracked. Bribes were also paid in the form of gifts but most service seekers were found paying bribes in cash to get their work done. TI-Nepal conducted the survey covering 2,205 respondents in nine districts. Almost half the respondents (1,051) said they were compelled to pay bribes to get their work done at the land reform offices in those districts. Similarly, 1,023 respondents said they had to bribe officials while receiving health service facilities at local levels. “Service seekers paid bribes to get their work fast-tracked. In their answers, some respondents said that they had to spend additional money even to get admitted to hospitals,” states the report. TI-Nepal had conducted the survey of service delivery in 13 different government agencies that members of the general public visit regularly to seek basic services. The offices surveyed are Land Revenue Office, Office of Survey, District Administration Office, Government Hospitals or Health Centers, District Police Office, Office of Transport Management, local bodies, Nepal Electricity Authority, Office of Drinking Water, District Agricultural Office, Revenue and Tax Office, District Education Office and District Forest Office. The government’s chief secretary, Som Lal Subedi, admitted to lapses in service delivery. “We have not been able to provide better service delivery as we are passing through a protracted political transition,” said Subedi. He also pointed out the absence of elected people’s representatives at local bodies as one of the major reasons behind poor service delivery. “Local bodies are running without elected people’s representatives and government officials at local level have to work as per the instructions of the local elites. This has also seriously affected service delivery,” said Subedi adding that around 40,000 local entities including ward citizen forums comprising civil society leaders and politicians have been formed to assist service delivery due to the absence of elected representatives at local level. The government officials are bearing a dual responsibility- political and administrative-as the political parties have continuously failed to conduct local polls since the tenure of the local bodies expired in 2002. Dismayed with the existing service delivery at the nodal points of government, the study has suggested to political parties and civil servants to play a more effective role to satisfy the service seekers. One Comment to "Land revenue offices most corrupt: TI-Nepal study"
This is why due to the myopic nature of leadership who has been holding the supreme power of government since over the centuries without doing nothing for the state, nation and citizens of Nepal. If we want to decrease the corruption level of state there should be E-governance policy with strong implementation in every area of Nepal by keeping hand cash ceiling as per the condition of remoteness based on the activities. if we make Rs. 10000 for hand cash in urban area and each head quarter of district and not allowed to purchase more than 10000 rupees by cash really decrease 80% corruption from government officials where almost all have gain a huge level of corruption through commission and broker. so we need to advocate against a policy level corruption.